I’ve been watching my three tomato plants as they have been doing their plant-thing. 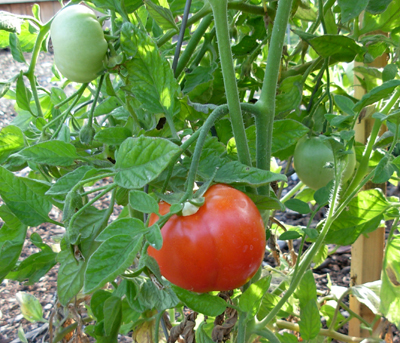 The Early Girl is being true to its name and produced the first ripe tomato. My plant has at least 20 tomatoes set and more blooms a-blooming. I took the advice of Marie at About Gardening and pruned back some of the tomato blooms in hopes of getting more ripe tomatoes. My cherry tomato plant is also putting on lots of fruit and the first one is now yellow. I have a third plant, which I think it another large tomato, and it is only now beginning to show some tiny tomatoes. Where is the L, you say? While I have some lovely heads of organic lettuce and my own lettuce growing outside, I actually don’t like lettuce on my BLT. It makes the B and T slide around too much. But if you say BT sandwich, folks don’t know that is. Really, it’s a BMT for me, as the mayo is an essential ingredient. Review: The tomato was perfectly sized to make one sandwich. 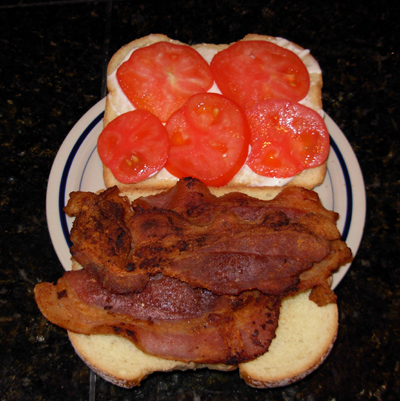 But the thick bacon overwhelmed the balance of the sandwich so I couldn’t really taste much of the tomato. I need to get some of the humane local bacon and see how that works.